Disney World is beautiful during the Christmas season, with decorations everywhere and special holiday shows, holiday foods and holiday souvenirs you can only experience for a couple months out of the year. That said, if you don’t like crowds, it’s not the best idea to visit Walt Disney World during the week between Christmas and New Year’s Eve (December 25-31). It is undoubtedly the most busy and crowded time of the entire year. But perhaps for one reason or another it’s the only reasonable time you can go. We’ve been in that position ourselves, so we completely sympathize. We’re here to tell you: you can have a great trip at Christmas. It will be different from a trip in the off-season, and the crowds will be huge, but there are some nice compensations, like lots of shows and holiday parades, special fireworks displays, longer park hours and beautiful decorations. 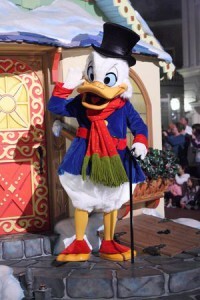 The key things that make a Christmas trip to Walt Disney World work are positive attitude and planning. 1. Mentally prepare yourself for big crowds and long lines. There is nothing you can do to change this, so just accept it. Stay positive! While there will be tired, grumpy people, there will also be incredibly cute children in princess outfits who have never seen a Christmas tree the size of a skyscraper or Mickey Mouse in his Christmas outfit, and that’s better than an hour of kitten videos to perk up your Christmas spirit. 2. Plan, plan, plan. Set priorities: what are your top 5 attractions in each park that you consider “must do” experiences? Once you know that, you really should have a touring plan, even if it’s just a list of rides scribbled on a napkin. Better yet, get yourself over to TouringPlans.com and print out the best plans for your party size, age groups and length of visit, or buy a copy of The Unofficial Guide to Walt Disney World and use the plans printed in the back (you can tear them out and carry them with you). Then follow them! Make sure to take full advantage of FastPass+ by prebooking your top three rides in advance. 3. Arrive at the parks early each day. Most people won’t get up early, so you’ll have shorter lines for the first hour or two. If you are staying on property, take advantage of the Extra Magic Hours, particularly the morning ones. During Christmas week, the crowds will start to grow enormously around 10 am and by noon the crowds will be pretty epic, especially in the “pinch points” where the walkway gets narrower. The lines will start going down late in the day, but they will never be as low as they are in the first few hours after opening. During Christmas it’s common for the Magic Kingdom to have a regular opening time of 8 am, and Extra Magic Hours at 7 am. If you can haul yourself out of bed and be in front of the Magic Kingdom at 6:45 am, the ride lines will be really, really short for quite some time. Yes, that means getting up at 5:30 am or so, throwing on clothes and heading out. Have a quick breakfast like yogurt or cereal, or have a bagel on the bus if you can. Remember, you can leave at noon, go back to your hotel and take a nap. 4. Magic Kingdom will usually reach capacity at one or more points during the week. December 25, 26 and 31 are the most likely dates when capacity issues may occur, but other days may be affected as well, particularly the Saturday of Christmas week. Epcot, Animal Kingdom and Hollywood Studios do not usually close completely, but the parking lots can fill up, and the parks will be very busy. There are several levels of staged closures, and in the first stages you may be able to get in if you are staying on-property (which includes the Swan & Dolphin and the Downtown Disney hotels), have a dining reservation in the park or if you entered the park earlier that day and are coming back. But if the park is truly full, it’s full — Disney has to follow fire codes! Typically the worst stages of closure will be in the middle of the day. It’s prudent to assume that you might not be able to enter the Magic Kingdom from about 11 am to 6 pm. The last few years the Magic Kingdom has reached closure stages 1 or 2 (out of 4), which means you could still get in if you were staying on site or had a meal reservation. However, every year is different; if a lot more people happen to come this year, they’ll close completely. So plan for the worst, especially if you’re staying off-site. You can arrive early and stay in one park all day, or leave mid-day and don’t plan to come back until after dinner. When we were there at Christmas, we just left the parks at about 1 pm, and didn’t come back until well after dinner (or didn’t come back at all). We made all our dinner reservations at resorts, which worked out exceptionally well. If you head back to the Magic Kingdom around 7 pm, you’ll pass a stream of tired, cranky people heading out who thought they could stick it out to the end of the day, but just couldn’t make it. If you do elect to stay in the park all day, bring any sweaters or jackets you may need later and stow them in a locker when you arrive (the lockers will also sell out). 5. Don’t plan on going on a lot of rides, especially in the afternoons. Instead, make it your priority to enjoy the atmosphere. If there is a band playing, stop and listen. Wander around and look at the decorations. Enjoy some holiday treats. Wave at the characters. There will be some rides with relatively reasonable waits, even in the middle of the day, like the Mad Tea Party, Carousel, Railroad, PeopleMover, or the Swiss Family Treehouse. The animatronic and movie shows are a good place to relax and get off your feet: Mickey’s Philharmagic, Country Bears, the Hall of the Presidents, and the Carousel of Progress, or at Epcot and Hollywood studios you can check out the various movies and shows in the World Showcase at Epcot or Muppet-Vision 3D. It’s pretty rare for these shows to have a wait time longer than one complete show length, and most of them have an air conditioned (or at least covered) waiting area. 6. Make dining reservations as soon as possible. You can make them up to 180 days (6 months) in advance, and you need to book them that early if you want the hard-to-get reservations like Be Our Guest, ‘Ohana, Cinderella’s Royal Table or Le Cellier. If you don’t need to get a specific popular restaurant you’ll be fine booking somewhat later, but don’t delay too long and definitely make some reservations if you want to have sit-down meals. If you don’t have any dining reservations when you arrive, you will have many fewer options for table-service dining. Most of the available reservations will be for very early or late, or at second-tier restaurants in resorts, or both. Epcot has many more restaurants, so there will likely be a few better options there. If you’re stuck, you can try our favorite “hidden gem” restaurants – reliable places to get a good sit-down meal that are not typically booked solid: Ale & Compass Restaurant (at the Yacht Club Resort), Olivia’s (at Old Key West), and the Turf Club (at Saratoga Springs). For other ideas and more detailed recommendations, we highly recommend the Disney Food Blog e-books, especially their Holiday Guide. 7. Plan to eat any quick-service meals at off-hours (lunch before 11 am or after 2 pm; dinner between 3pm and 4:30 pm or after 8 pm), or you’ll be waiting in line for a long time. Consider bringing some snacks, like granola bars, string cheese and juice boxes, with you to stave off starvation, or budget for plenty of churros and ice cream (which will also have lines, but not as long as the ones for the restaurants). 8. If you have young children, rent a stroller in advance. In crowded conditions it is very hard to keep track of kids on foot, and it’s also exhausting for little kids to fight their way through masses of people. A stroller is completely worth it, even for kids who would normally be a little old for one. We recommend Magic Strollers, which will save you a ton of money compared with renting from Disney. It also saves you time: you can roll right into the park and get into line for a ride, instead of waiting in the line to rent a Disney stroller. 9. Work all the angles for the popular shows. If you want to see the first Fantasmic! show of the night (or if there’s only one that night) at Disney’s Hollywood Studios, buy the Fantasmic! Dinner Package or use one of your FastPass+ selections for Fantasmic!. Otherwise you are facing a very, very long wait in line for the show, or you may not get in at all; we recommend getting in line two hours early during peak periods for the first show. If there are two shows and you can wait for the second, it gets better (an hour early is probably OK), and if there is a third show, you can probably show up 30 minutes early for that one and still get a seat. If you do get a FastPass+ for Fantasmic!, you’ll still want to arrive about 30 minutes early. Likewise, if you want to see the Candlelight Processional at Epcot, buy the Candlelight Processional Dining Package or you probably won’t get in. 10. Schedule some “down time” during your vacation. It is extremely stressful to spend the whole day fighting crowds. For every three days you spend in the parks, consider taking one whole day off to explore the cheap and free things to do at Disney World. All this may seem daunting, but don’t be discouraged! We avoided Walt Disney World at Christmas for years, but eventually there was no way around the kids’ school schedules and we had to go during the absolute peak time. We went with a big family group and had a blast. We’re old hands at Disney, which made things smoother. But we personally know multiple families who aren’t Disney experts and decided to go at Christmas; they followed our tips and had a great time. Just mentally preparing yourself for crowds is a huge help, and any amount of planning is better than no planning at all. Good luck and enjoy your trip!